Welcome to Our STEM Blog - "Campbells Connect!" 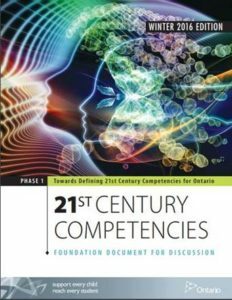 2.Emphasize and teach higher-order learning skills such as critical thinking, communication, collaboration, and creativity. In order to promote critical thinking, communication, collaboration, and creativity and Campbells, we set out to teach higher-order skills through the use of science, technology, engineering, and mathematics (STEM). 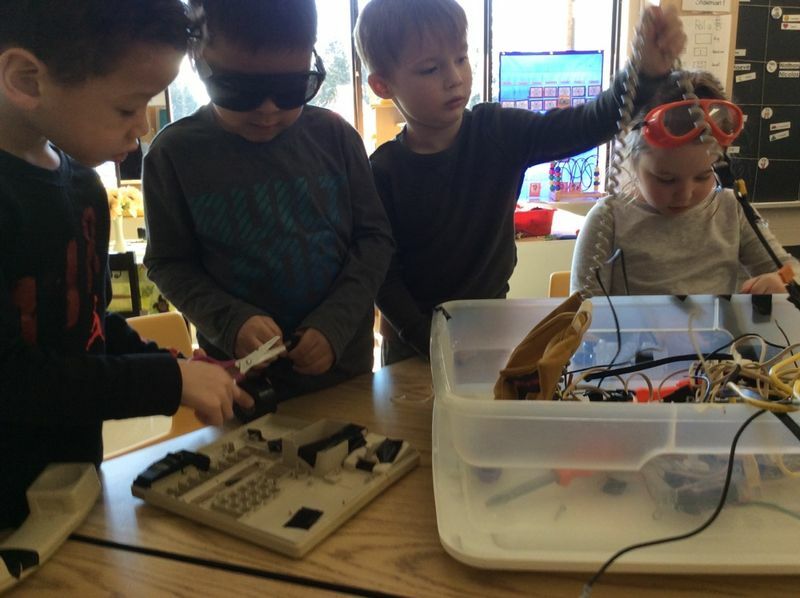 Through individual and small group instruction, engage students in projects where they must complete challenges collaboratively, using communication and critical thinking through the use of coding, robotics, and electric circuitry, and building challenges. 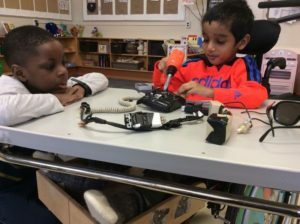 Please check back to our blog regularly as our students share their learning! This week we had a special visit from “Scientist in the School”. The topic of exploration for this session was magnets. 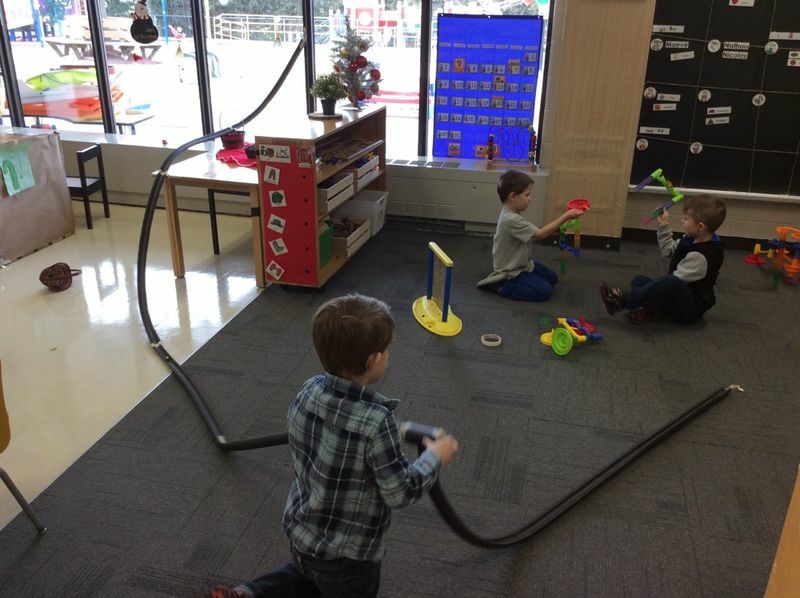 Some of the activities the scientist brought were creating a magnetic fish and fishing, testing out attracting and repelling using cars, building with different magnetic manipulatives, as well as creating magnetic “magic” like the butterfly activity pictured. We will use this session as a talking point as we continue to explore magnets. February 13th, 2019 – 3, 2, 1 Launch! This week we put our creative minds to work to construct catapults using elastics, spoons, and Popsicle sticks. Students were then given a small cup as a target to try to launch their pompom into. Students used problem solving to adjust their catapult as well as the location of their cup to try to hit their target. This week we continued to explore using the Makey Makey. 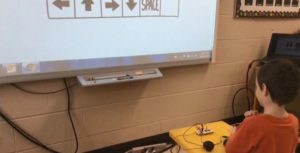 Students enjoyed playing two new games while exploring electricity. One of the games was whack-a-mole, students used a metal spoon to hit the corresponding piece of play dough to make the mole go back into his hole. The other game students explored was a drawing activity. Our play dough was attached to the directional keys on the Makey Makey which allowed the students to move a sprite on the screen that left a trail of colour. The students enjoyed creating some really colourful pictures while practicing directions. This week we explored creating circuits with a controller called a Makey Makey. The Makey Makey was given to us by a parent to try out with the students. This product allows you to make any object that conducts electricity into a switch or controller. You can then plug it into the computer and play online activities. Pictured is a student playing piano by manipulating play dough. The current travels from the computer, into the Makey Makey, through a wire, into the students arm, out of the other arm, into another wire, and then into the appropriate controller on the Makey Makey. After building foundational knowledge of how electricity travels, we took a look at snap circuits. Snap circuits fit easily together but a much more specific sequence must be followed in order for the sequence to work. 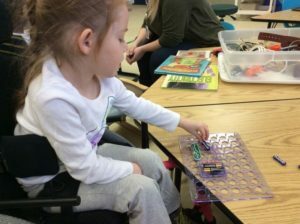 The snap circuit kit comes with clearly labelled diagrams and pieces and students need to follow the numbers on the diagram to make the circuit work. We started out by only giving the students the pieces they need as there are 300 pieces in the kit. The ages on this kit are 8-108 but with the proper guidance and set up a lot of our kindergarten students had no problem putting them together. What a surprise! 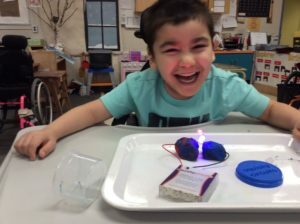 After spending all of that time discussing the fact that electricity travels through wires, students were amazed to find out that play dough can also act as a conductor! We tried out a product called squishy circuits this week. Students can build something using play dough, connect the battery pack, insert lights, sound, or a fan and you have yourself a really cool circuit! This activity combines students knowledge of creating a circuit with the ability to use their imagination to bring their creation to life! This week we needed a little bit of energy as we return from the winter break so we started to talk about electricity! Our school has a “Snap Circuits” kit which allows students to make an electrical circuit based on a diagram. This task can be pretty daunting to start on so we broke it down into simpler tasks to start. As a class we discussed where electricity comes from and how it travels along wires. 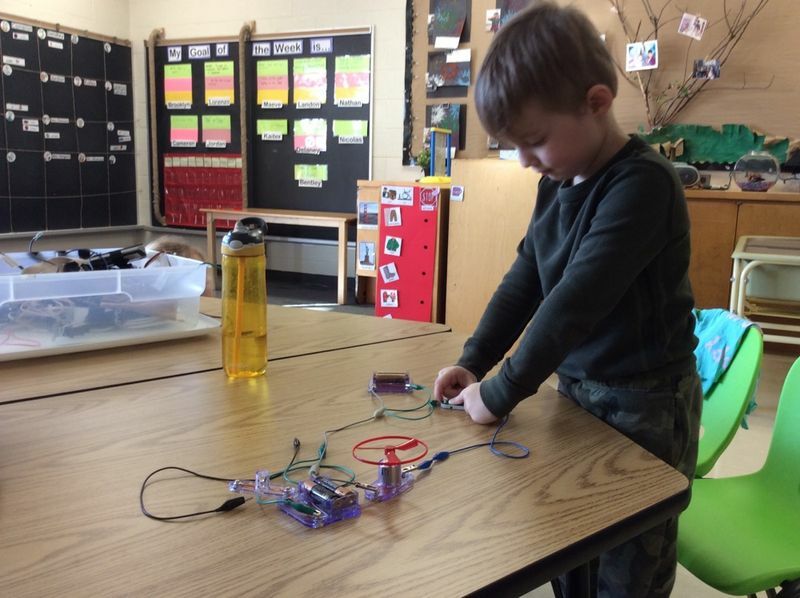 Students were then shown how to make a simple circuit using some pieces from our snap circuit kit as well as some gator clips. Students spent time trying to make their own circuit in small groups. The rest of the class was invited to explore my maker box that was filled with everything electricity this week! Students were found making their own robots and generally taping everything together with electrical tape. 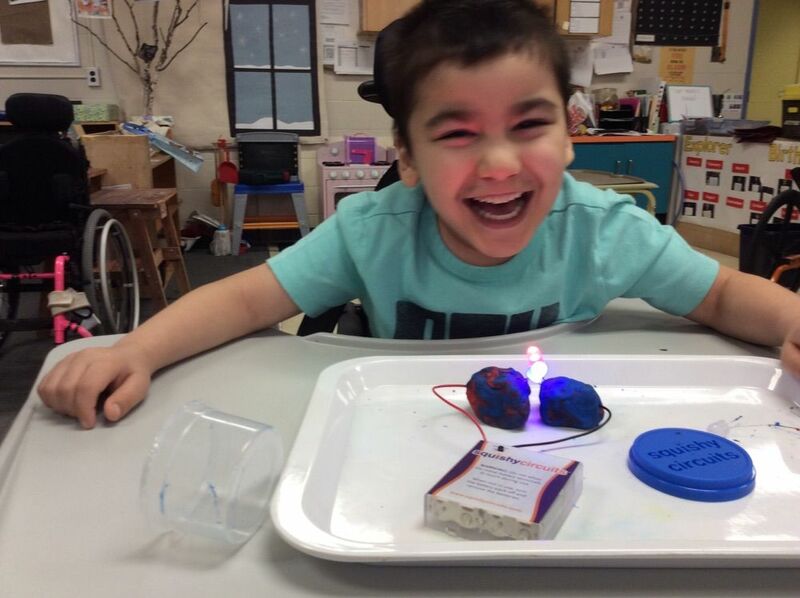 Check back next week as we explore squishy circuits! This week we created structures and pathways which allowed our marbles to move from one point to another. 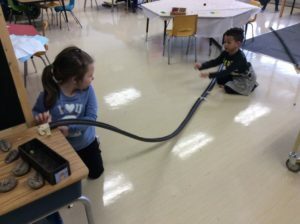 Students were challenged to engage in some critical thinking as they were provided with tape, marbles, and pipe insulation. Their imaginations took off and so did a lot of marbles! A lot of teamwork and collaboration was witnessed as students built, tested, dismantled, and retested. Check out some of the structures our students built! This week the students were introduced to a new app that uses our OSMO interactive pieces. The Awbie app allows students to take an adventure in coding, Awbie’s house is blown down and students must navigate his world to collect pieces to rebuild his home. 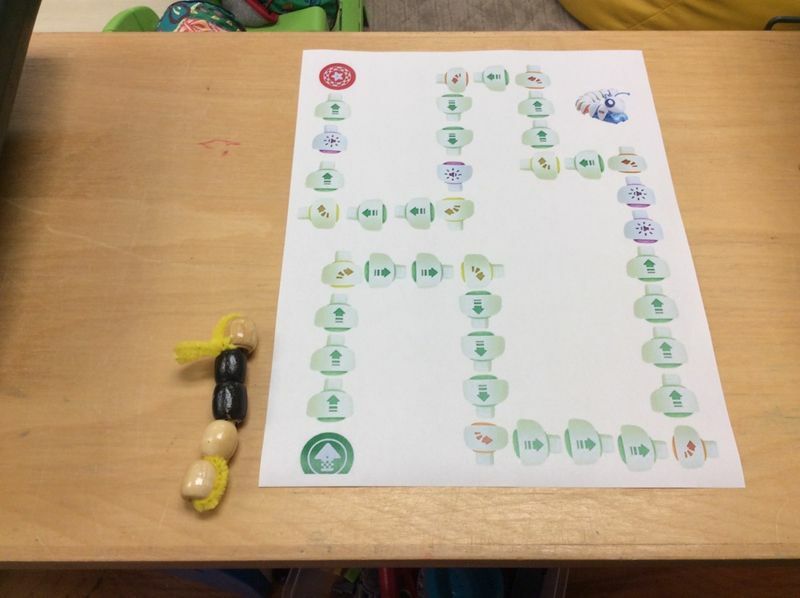 Students slide command pieces (walk, grab, jump) along with a number to navigate Awbie’s world. Attached to the camera is a red device which recognizes what pieces the child has chosen and allow Awbie to move. This is a great game which combines manipulatives with an iPad and allows students to engage in new and interesting ways. 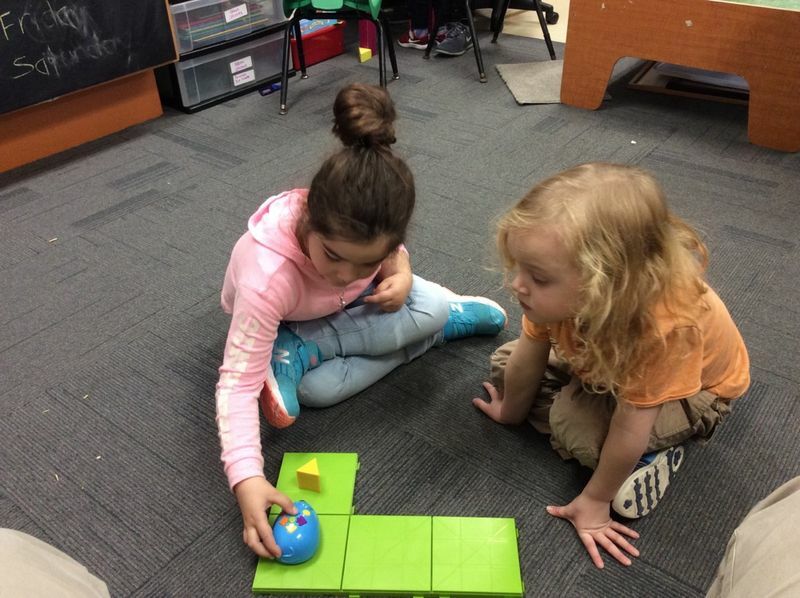 This week we are revisiting coding with the help of our Robot Mouse. 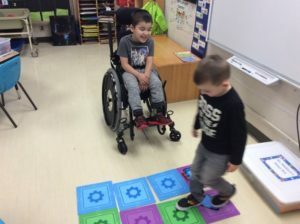 Using the robot mouse combines the directional skills we learned with the code-a-pillar with the one step at a time sequencing skills we used with the code a friend activity. During this activity, partners challenged each other to complete a maze. 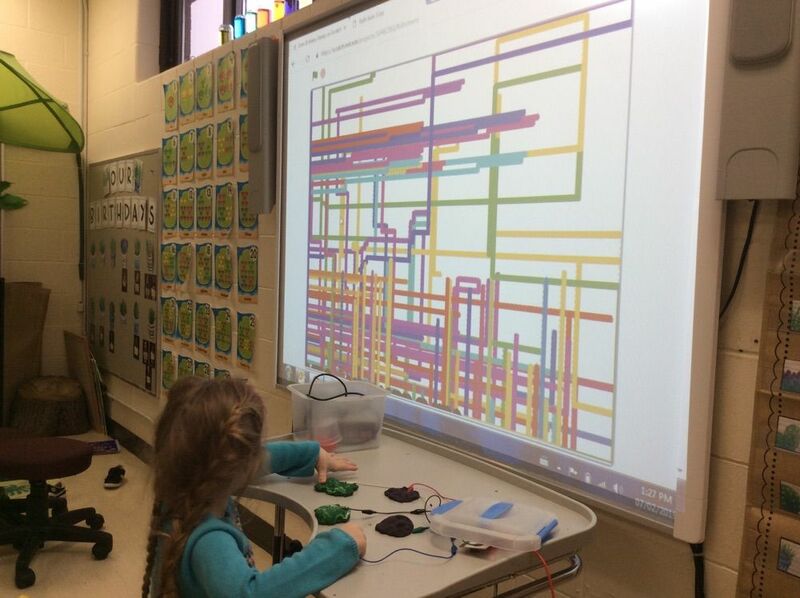 One student created a maze, while the other attempted to program the mouse to navigate the maze to get to the cheese. We started with just a few tiles and gradually built on to increase the difficulty by adding more tiles, walls, and tunnels. This week we are getting ready for a visit from Scientist in the School! The focus for the visit will be strong and stable structures. We started our inquiry by reading some books about the parts of a house and what makes them strong. Students were then encouraged to build their own structures using a variety of materials. Pictured you will see a group of students building a house with a variety of foam shapes. 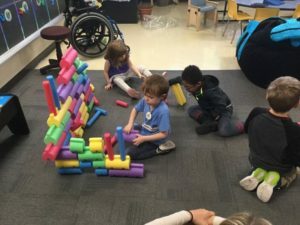 This activity was an excellent opportunity to focus on communication and collaboration as students shared the responsibilities of building a structure, then problem solving if it fell over. November 6th, 2018 – Code a Friend! This week we extended our knowledge of coding by coding a friend! One student pretended to be the robot as the other was the programmer. We used the “Let’s Go Code!” activity set to do some physical coding and engage our whole bodies. 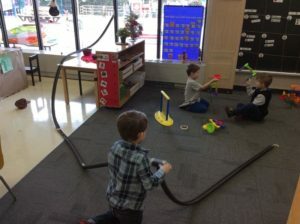 Students used the commands they used with the code-a-pillar (left, right, forward, backward) with the addition of some new commands, such as jump and pick up. We found the individual tiles with this set very beneficial for showing student what one step looks like. The use of tablets is sometimes regarded as having an adverse affect on a child’s fine motor skills, such as printing skills. But what if we can use technology to motivate and enhance a child’s fine motor skills? 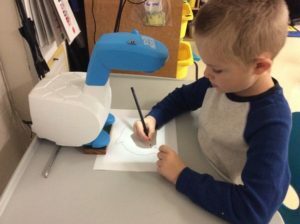 We we lucky to receive a donation of a Smart Sketcher drawing projector. This is a miniature projector which walks students step-by-step through the process of drawing different pictures. Here we see Evan carefully and independently drawing a dolphin. 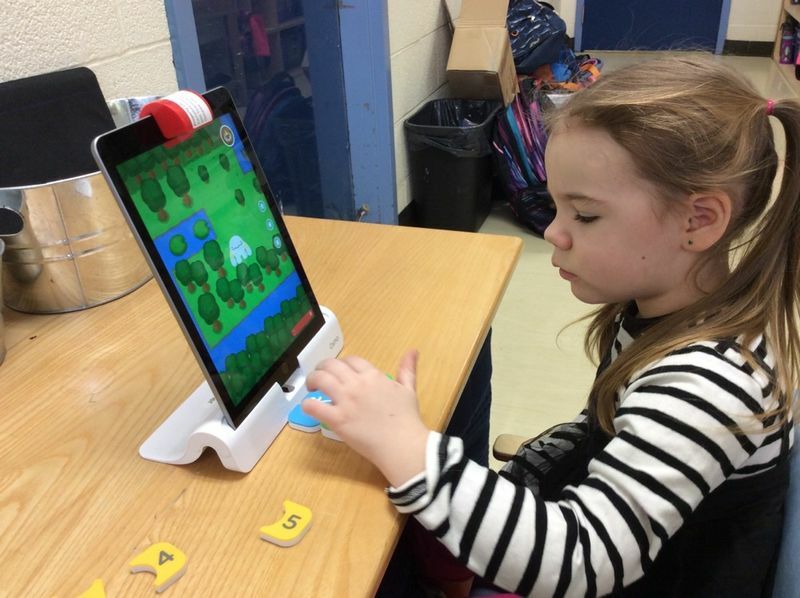 At Campbell’s we invested in a product called OSMO which allows a child to interact with iPad in a different way. The app pictures here is called OSMO Monster. Mo the Monster walks students through a story of their choosing and the student plays an important role in the story. 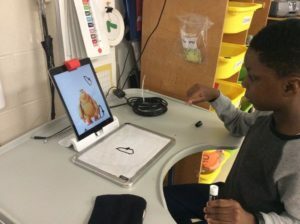 The student must be the illustrator, anything the students draws on a whiteboard in front of the iPad is pulled in by Mo and used as an illustration, so cool! October 16th, 2018 – What else can we do with Cody? Fisher Price offers a free app that helps introduce how to sequence using the code-a-pillar. Our students really enjoyed using this app alongside the code-a-pillar. For students who had a hard time visualizing the steps to get code-a-pillar from the green to red disk, the app provided a good visual representation of the sequence. Once students were able to solve the sequence in the app, they replicated the steps with the actual code-a-pillar. 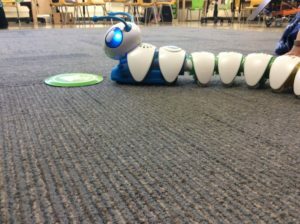 The code-a-pillar was so popular that I found many students were restless waiting for their turn! Students were invited to create their own code-a-pillar using pipe-cleaners and beads. Students were also given a challenging sequence to try with their very own code-a-pillars. They were encouraged to verbally repeat the sequence (forward, right left) as they navigated the maze. Code is a language which is used in computer programming. Code is what makes it possible for us to create apps, websites, and computer programs. Teaching coding allows students to problem solve, breaking down a problem into simpler steps to achieve an end result. 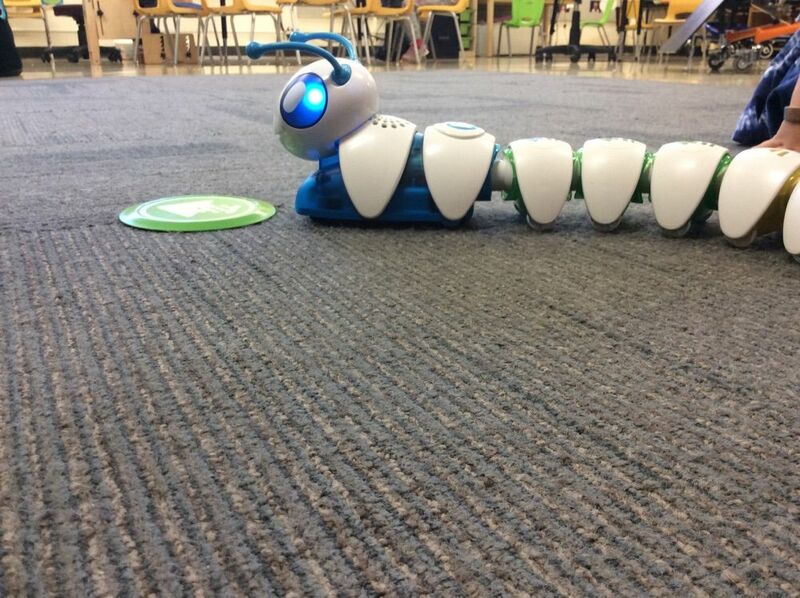 The code-a-pillar is an excellent way to introduce coding to students. 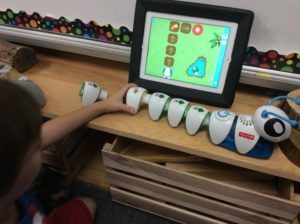 The goal for students is to input a sequence of commands (forward, backward, left, and right) to help code-a-pillar achieve his goal to make it from the green disk to the red disk. The code-a-pillar is the perfect way to introduce coding with only a few basic commands and its USB segments that easily click together. After exploring and learning the basic commands, students were challenged to make a maze with blocks for “Cody” to navigate as well as a tower for “Cody” to knock down.